Economics is a big, big tent. Within econ there are many schools of thought. One of these is what I call "101ism" (I didn't invent the name but I forget who did). 101ism is the set of ideas that most people take away from Econ 101. We all know basically what 101ism says. Markets are efficient. Firms are competitive. Partial-equilibrium supply and demand describes most things. Demand curves slope down and supply curves slope up. Only one curve shifts at a time. No curve is particularly inelastic or elastic; all are somewhere in the middle (straight lines with slopes of 1 and -1 on a blackboard). Etc. Note that 101 classes don't necessarily teach that these things are true! I would guess that most do not. Almost all 101 classes teach about elasticity, and give examples with perfectly elastic and perfectly inelastic supply and demand curves. Most teach about market failures and monopolies. Most at least mention general equilibrium. But for some reason, people seem to come away from 101 classes thinking that the cases that are the easiest to draw on the board are - God only knows why - the benchmark cases. Josh, I apologize for picking on you! This is only one small example out of many, many I see all the time. It was just a convenient one. I promise to buy you a beer as recompense. First of all, notice that "immigration has a big negative effect on native-born wages" - what Josh calls "econ 101 models" is actually a much stronger result than 101 teaches! In 101, demand curves may slope down, but they need not slope down very much. If demand curves are very elastic (i.e. flat), then a large positive supply shock will not decrease price very much. In other words, if labor demand is elastic, then we'd expect to see a very small negative impact of immigration on native-born wages - which is, in fact, exactly what we see in study after study (survey paper 1, survey paper 2). So a very small negative effect on wages is perfectly consistent with 101. The Card and other immigration papers are not inconsistent with 101 in the slightest. But 101ism demands that elasticities be somewhere in the middle (because slope 1 and -1 lines are easy to draw on a board), so effects are never supposed to be very small. 101ism says that moderate elasticity should be the benchmark, and very high or low elasticity is a puzzle that needs special explanation. Now suppose we go beyond 101 itself, to 401. Now we're thinking about general equilibrium. In general equilibrium, a positive labor supply shock can induce a positive labor demand shock, so that wages go right back to where they were before. That demand response might come pretty quickly. If we go beyond 401 and think about things like variable capital utilization, then the demand response might come very quickly, so even the instantaneous effect of immigration on wages would be smaller than partial equilibrium analysis would suggest. Why should partial equilibrium, rather than general equilibrium, be the universal benchmark? Just because general equilibrium is a bit harder to learn, does that mean that general equilibrium effects should be treated as puzzles in need of explanation? What about search models, models with monopolistic competition, etc.? Anyway, this is my problem with 101ism. It treats certain theories as benchmarks even though they have no right to be. Which means that it treats lots of empirical results as puzzles even though they don't deserve to be. People, simplicity does not equal generality. So what is the antidote for 101ism? If 101 classes already include things like perfectly elastic and perfectly inelastic curves, monopoly, general equilibrium, and market failures, then what can educators do to prevent students turning into 101ists? My recommendation is the same as before: Put empirics in 101. Seeing results like Card's that contradict simple 101ist stories - but can be easily explained with 101 concepts - will force students to think about the fact that elasticities are not always moderate, that partial equilibrium is not always the whole story, that market failures sometimes exist, etc. etc. In other words, empirical results will aid in giving people a fuller, richer understanding of basic econ theory in all its versatility. Why does immigration having a small effect on wages contradict 100 level material? Comparative advantage is a thing and producers are consumers is a thing. It's not clear a priori with Econ 101 assumptions that free migration lowers wages. the Card/Krueger/Borjas/Peri debate is about low-skill immigration in a constrained geogrphical area and the impact on relative wages. Its not about the non-puzzle you seem to hav in mind that US wages have risen historically desite constant immigration (or pop growth for that matter). So at first blush "general equilibrium considerations" likely less relevant. At least the Peri side of that debate - and some of the resonses by others - is in fact about general equilibrium considerations and not just limited geographic area. Although there's a whole bunch of papers there so you might just be thinking of a particular one. In theory, this seems fine, but the key constraint on what you can do in econ 101 is the capacity of the students. It would be great if we could teach econ 101 to students who are already tooled up in math and statistics. Also, it would be great if they would come to class, pay attention, and not go to sleep. I taught the macro half of intro to economics once (700 students total), and if I never had to do that again, I would die happy (my students likely agree). Some people have suggested that we ditch econ 101 and start right in at the intermediate level. Of course, econ 101 is often a general education requirement in undergrad programs, and it's high enrollment - helps to justify your existence to the rest of the university. It's meant to draw in students, and has been dumbed down to the point where the only tool that is taught is two curves that cross and shift around. Now, back to the immigration question. (i) Suppose I have an economy in which everything is produced with labor. Then, if I introduce a population of immigrants with the same mix of skills, nothing happens. We're just scaling up the same economy, and relative prices, and wages don't change. (ii) Suppose instead that I have an economy with capital, and skill is something you're born with - also, everyone lives forever. Introduce a population of immigrants with the existing skill mix, and wages will go down in the short run, given that capital is fixed in the short run. But in the long run, the capital stock adjusts, and the answer is the same as in the first case. No long run difference. Next, imagine that the skill distribution of the immigrants is different from that of the existing population. This matters in the short run both for the aggregate wage rate, and for relative wages (just how depends), but if human capital can be adjusted over time, in the long run, once again, this should not make a difference. So, if immigration is about anything, it's about the short run, and adjustment. You could think of all kinds of reasons why this would be good for aggregate welfare, by some measure, and we shouldn't be focused only on what happens in the short run to the wages of particular groups. But, it's a general equilibrium question. Maybe it's not just our econ 101 students, but also our labor economists who are blinkered by partial equilibrium. I think regression discontinuity design is actually easier to understand than price theory. George Borjas recently commented on the analysis of the effect of the Mariel boatlift and wages in the non-skilled sector that points to some of the efforts to cloud the issue. Unfortunately for Noah Smith, it is a right-wing site. But I'm sure he can bypass the "dog whistles", whatever those are or mean. George Borjas fudged his data. Discredited. Be careful lest you find yourself in precisely the same boat. It sounds like the real story is the data set was very small, so when Borjas applied what would otherwise have been reasonable filters, he got an extremely tiny data set. It was indeed bad of him not to clearly state so up front. But there's no reason to accuse him of data mining. Meanwhile you're looking very silly as well - Frum rightly roasts you for your daft support of the Peri-Yasenov paper without apparently having really understood their equally wrong treatment of the data. If you want to show you care about the facts, man up and retract, and don't dodge the subject by trying to turn it into a discussion of 101ism. Isn't there a sort of equivalent "401ism" danger, which is that (smart) people airily assume that, virtually irrespective of what one does or happens, "in geneeral equilibrium", afzer a lag of uncertain length, everything goes back to what it was (or the trend it was on)? What I like are the discussions of San Francisco-area real estate that act like it's engraved in stone that the answer to high rents is "build, baby, build!". You could also take the view that if San Francisco is really popular, instead of trying to *fix* San Francisco, you should try to build more places *like* San Francisco. Suburban low density is assumed to be inviolate and obviously all you need to know is supply-and-demand, and some people just don't get Econ 101, and oh you silly elitist NIMBY you. My B.S. alarm has sounded. In the Silicon Valley labor market in which I competed over three decades, employers successfully bribed politicians for the privilege of importing foreign workers willing to work for much lower wages than the prevailing wages of Americans. Employers assumed that I wanted much higher wages than they would have to pay imports. Thus, on the rare occasion on which they were willing to meet with me the purpose of an employer was to find that my (very good) credentials were inadequate. Is modern economics unable to deal with realities of labor markets such as bribery of politicians by employers? It seems so. Perhaps they took it and only remembered a few key or memorable things...that seems typical of how people learn. I think the issue may be bigger than what is taught in Econ101. I think the issue is that people struggle whenever facts disagree with their intuition. The concepts taught in Econ101 just happen to be the most intuitive concepts. The world is too complex to fully understand much (if anything), so most of the time people rely on intuition/instinct. And because this works 99% of the time, people have a hard time coping with issues that disagree with their intuition. But it comes to pretty much the same result in the end. You need to teach people to be skeptical of their intuition and that is most easily accomplished with real world examples. can you please unblock me on twitter @prateekm1 .I did not say anything rude to you. You thanked me and then blocked me. I really like reading your account. It's not strange that Card found small wage effects of immigration - that's perfectly consistent with very elastic labor demand. What IS strange is that Card also found small disemployment effects from the minimum wage - implying very inelastic labor demand. Noah is right that we have to move beyond the 101 model in many cases, and maybe the matching/sorting models of labor markets can generate both results. But I would not dismiss the puzzlement at the combination of those two results. If I could do it over again I'd do econ, v math/comp-sci. I'd be poorer, but happier. Probably. Yeah, you can tell by reading the comments sections of econ blogs just how happy people with training in economics are. Separately, I clicked on your name rather than "reply" by mistake. I see you are "recovering." Good for you. Also I like the humility implied by your close there. Nice. 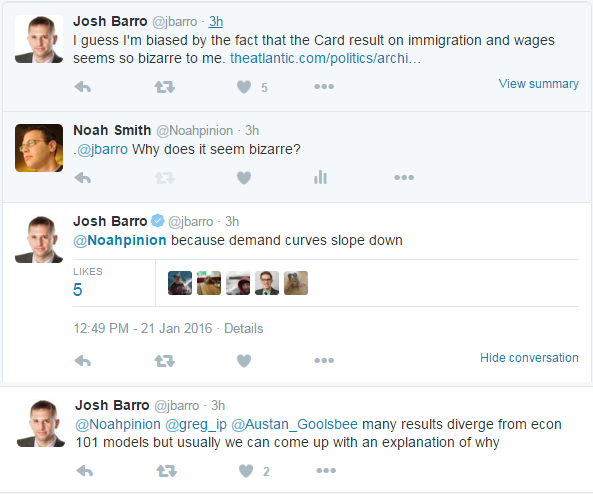 The problem with substituting Empirics101 for Econ101 is that... it doesn't actually answer Josh's question. Immigration has no effect on wages. Ok, but why the hey not? Empirics can't tell you that. One way or another you're going to have to do... dreaded word coming up... theory. Why not teach a simple version of general equilibrium? Don't have to do Edgeworth boxes. Just say: immigration increases supply of labor (shift the curve). This increases return to capital which increases investment. If labor and capital are complements this increases demand for labor (shift the curve). Explained. Sure, maybe it's slightly harder than "just shifting one curve at a time" but come on, not that much harder. We ask students to learn calculus and memorize poems. In calculus we even sometimes ask them to learn craziness like functions of two variables. In lit we have them analyze poems which mix different meters or rhyme structure. This isn't that different. In my 36 years of teaching 101, I've never once said "immigration has a big negative effect on native-born wages". I sometimes say that an influx of foreign gardeners will suppress the wages of native gardeners, and I often say that an influx of foreign sugar will suppress the price of domestic sugar. It has been established in the research literature for about half a century that what is taught in introductory microeconomics is incoherent nonsense. The opposite attitude to 101ism, and every bit as silly! This may have been stated earlier in the comments, but the effect of immigration on the labor supply is offset by the immigrants themselves - who also bring added demand with them. Resources to provision the immigration population is added by the immigrants, while monetary capital is added when businesses borrow to expand and when immigrants themselves borrow to buy cars and houses with standard bank loans and goods and services with credit cards. The duration of negative effects is dependent on how robust the market is. This is general equilibrium. See, not too hard a concept!! Demand and supply curves do not have a single elasticity except in the 3 special cases of unit elastic, perfectly elastic and perfectly inelastic. In general the elasticity will vary along the curve. Sure, but elasticity near the current point of intersection will be roughly constant. ULE, sorry but that's just incorrect. Yes, for an arbitrary demand or supply function obviously elasticity will vary along the curve - that's that word "arbitrary" in there. But that does NOT mean that for elasticity to be constant it has to be either 0, 1 or infinity. There's a whole bunch of other numbers there between 0 and infinity. Like 3. Or 87.43. Or quadzillion. Fair enough, but none of that is very econ101y, which is the subject of this post. 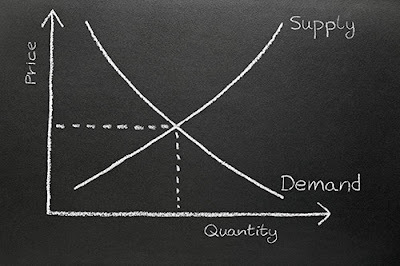 The demand and supply curves you see in introductory textbooks, which are (in my experience) generally linear, have varying elasticities along the curve. In fact a common trick question to catch students out is whether the curve is elastic or inelastic. Agreed with this until we got to "empirics is the answer." There is so much to cover in so little time. 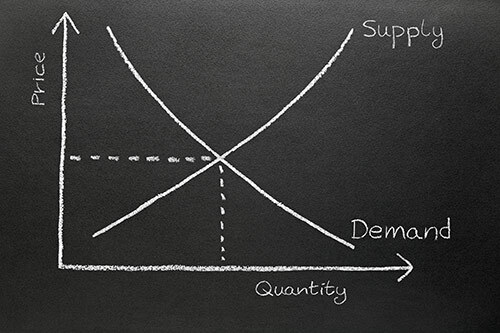 The approach to teaching supply and demand curves may need some adjustments but empirics won't do anything except take up valuable needed time. Isn't it true that what you are saying is true of almost any subject matter though? You teach people 101 level material in any subject and they are prone to over generalizing. They have just enough information to be dangerous. I meant regularly cries the idea that supply and demand have SOMETHING to do with low salaries. Alright, so let's think about this by analogy. Physics 101 focused on a very simple Newtonian world and ignores even air resistance. Should we counteract this by making Physics 101 students spend a lot of time measuring drag coefficients? The point of nearly every intro class is to introduce students to some core theoretical concepts. These tend to be very simple and powerful when applied correctly, but lacking in nuance. But the purpose of the course is to build up enough skill with that theory to give students something useful. Throwing in a bunch of empirical work is just prevents students from having the time to complete the core learning objectives. Like you say, no Econ 101 course every actually *teaches* the view you're identifying as 101ism. There's always some time spent on extreme elasticities, monopoly, etc. You seem to be saying that students aren't absorbing the lessons of that material. You think the answer to the fact that students aren't absorbing what they're being taught is to pile on more material? The thing is, physics students know that they cannot use the models without friction in the real world. Econ101 comes up in political debates all the time. Also, adding friction simply adds one mathematical variable to the original equation. The list of assumptions is much longer in econ101, and the assumptions themselves far stronger. This has nothing to do with the strength/nature of Physics 101 vs Econ 101 assumptions and everything to do with the weight given to the opinions of experts vs. laymen. Physics 101 comes up less because the average political actor of consequence cedes to the experts on such matters. If Congressmen and pundits, rather than physicists and engineers were the ones dealing with these issues, things would get ridiculous very rapidly. Look at the Congressman who wanted to know if Guam would "become so overly populated that it will tip over and capsize." That's grounded in an iffy Physics 101-type understanding (place to much weight on something small and you have a problem), but Congress listens to the experts on these matters, so it's a non-issue. Students who take a single semester of any subject are going to come away with a very shallow and poor understanding of the subject. There is no pedagogical change that will solve that problem. But the real problem here is that people who clearly have a poor/shallow understanding of economics are taken seriously when commenting on subjects that matter to the real world. If we were discussing space travel and someone with a single semester of Physics knowledge tried to weigh in on the public debate and tell the experts that they were wrong, that person would be completely dismissed. The same thing should happen with Economics, but it doesn't. Why not? You apologize to Josh Barro in this post, but quite frankly he should be embarrassed. The economy is a whole bunch of laws, securities and corporate documents, every large company has its own economics and be successful in business - is able to structure all its economic documentation, and will help you in that this resourceonline data room !